1) The 'Land Administration Domain Model (LADM)' was approved as an official International ISO Standard a on 1 November 2012, a milestone for FIG. The proposal for this standard was submitted by FIG to ISO almost five years ago. LADM defines terminology for land administration, based on various national and international systems that is as simple as possible in order to be useful in practice. LADM covers the compete domain, surveying included.It is highly relevant that documented field surveys can be included, in combination with reconstructable adjustments to the spatial database. This paper will focus on (cadastral) geodata acquisition, based on field surveys in the context of the ISO 19152 Draft International Standard (DIS) Land Administration Domain Model (LADM). During the development of LADM existing standards have been re-used as far as possible. Original observations related to adjudication, and all geodata maintenance, because of land transactions, physical planning, establishment of mortgage, etc. need to be documented. This is for quality, consistency and integrity reasons. The documentation is the basis for authenticity of the administrative and geodata. In case of cadastral geodata this documentation is often referred to as "evidence from the field".Data acquisition can be based on variety of approaches (low cost / high tech), which not always involves conventional terrestrial surveying. Observations may require transformations and adjustments, or other corrections (e.g. rectangulation), before the cadastral geodata for spatial units can be edited. Those transformations and adjustments can be documented again. All different types of the geodata acquisition can be represented in LADM. However, procedures for data acquisition itself are not included in the standard.d. In the process towards the inclusion of Land Administration information within the geo-information infrastructure, or in more popular terms: the Geoweb, standardization forms a basic condition. Land Administration information is a key element in the geo-information infrastructure (Geoweb), and strongly related to other registrations. The LADM has been submitted to ISO/TC211 (Geographic information), for formal standardization and integration with other ISO/TC211 geo-information standards, such as ISO/IS 19107 Spatial Schema, ISO/IS 19108 Temporal Schema, ISO/IS 19111 Referencing by Coordinates, ISO/IS 19115 Metadata, and ISO/DIS 19156 Observations and Measurements (O&M). The LADM has currently the status of a Final Draft International Standard (ISO/DIS 19152) and was distributed in March 2012 by the central ISO secretariat for a three month voting time period (ISO, 2011). This paper is focusing on the Surveying and Spatial representation sub-package of the LADM. First we will introduce the LADM into more detail in Section 2. In Section 3 attention will be given to the possible representation of spatial units into LADM. Section 4 gives a short overview of the imported model ingredients/functionality from other ISO standards. 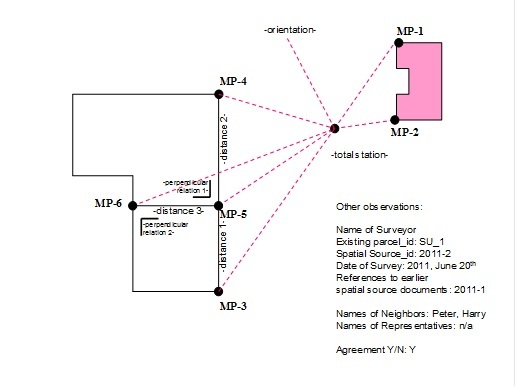 Cadastral Mapping is the issue of attention in Section 5. The flexibility of the LADM is further demonstrated in a more elaborate case described in Section 6. Finally conclusions are presented in Section 7. Many LADM classes are subclasses of the superclass VersionedObject. Class Versioned-Object is introduced in LADM to manage and maintain historical and quality data for the complete contents of the database developed based on the LADM. Management of historical data requires, that inserted and superseded data, are given a time-stamp. See Figure 1. Apart from the inclusion of management of history and quality for the complete database, also source documents can be included. In principle the updating of the database is based on authentic source documents – which can not be changed. Class LA_Source has as attributes submission (the date of submission of the source by a party); acceptance (the date of force of law of the source by an authority); and recordation (the date of registration – recordation – of the source by the registering authority); extArchiveID for identification of documents in external archives; lifeSpanStamp (history management –the moment that the event, represented by the instance of LA_Source, is further processed in the LA system (this is the moment of endLifespanVersion of old instances, and the moment of beginLifespanVersion of new instances of related objects in the database such as LA_Party, LA_RRR, LA_BAUnit and LA_SpatialUnit; see below for an explanation of these classes); this is the “database time”, compare the time stamps in LA_VersionedObject); sourceIdentifier; mainType (the type of document according to ISO 19115); see Figure 2. The abstract class LA_Source has two specializations: LA_AdministrativeSource and LA_SpatialSource. 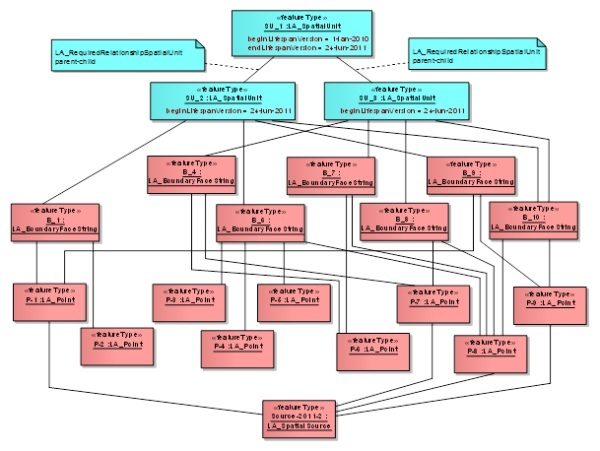 The conceptual schema of the LADM is organized into three packages (ISO, 2011): 1. Parties; 2. Basic administrative units, rights, restrictions and responsibilities; and 3. Spatial units. The last package includes the surveying and representation subpackage. The main class of the Party Package is class LA_Party with its specialization LA_GroupParty. 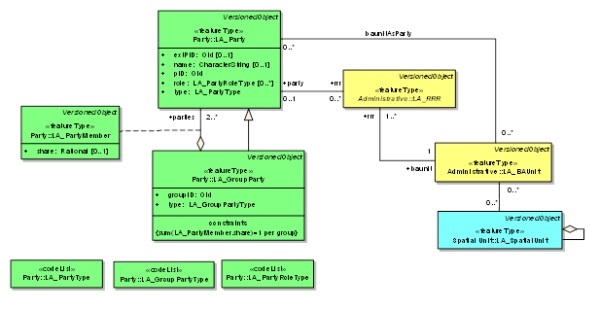 There is an optional association class LA_PartyMember (Figure 3). Parties are natural or non natural persons, or groups of persons, or juridical persons, that compose an identifiable single (legal) entity. A “group party” is any number of parties, forming together a distinct entity; e.g. a village community or a tribe. Types of LA_Parties can be extended by CodeList LA_PartyType. The Administrative Package concerns the abstract class LA_RRR, with its three subclasses LA_Right, LA_Restriction, and LA_Responsibility, and class LA_BAUnit (Basic Administrative Units), see Figure 4. A “right” is a action, activity or class of actions that a system participant may perform on or using an associated resource. A “restriction” is a formal or informal entitlement to refrain from doing something. A “responsibility” is a formal or informal obligation to do something. A “baunit” (an abbreviation for “basic administrative unit”) is an administrative entity consisting of zero or more spatial units (parcels) against which (one or more) rights (e.g. an ownership right or a land use right), responsibilities or restrictions are associated, as included in a Land Administration system. An example of a “baunit” is a basic property unit with three spatial units (e.g. an apartment, a garage and a rural parcel). It should be observed in relation to this that rights, restrictions, and responsibilities may affect only a part of the spatial unit, with the geometric representation of that part missing. A “baunit” can be a group of spatial units under a zoning plan, which is under development. Or, a group of spatial units as basis for taxation. A basis for taxation can be more than property in case lease is included: so a “baunit” for taxation is not necessarily the same as a group of spatial units forming a property. The Spatial Unit Package is most relevant given the focus of this paper. 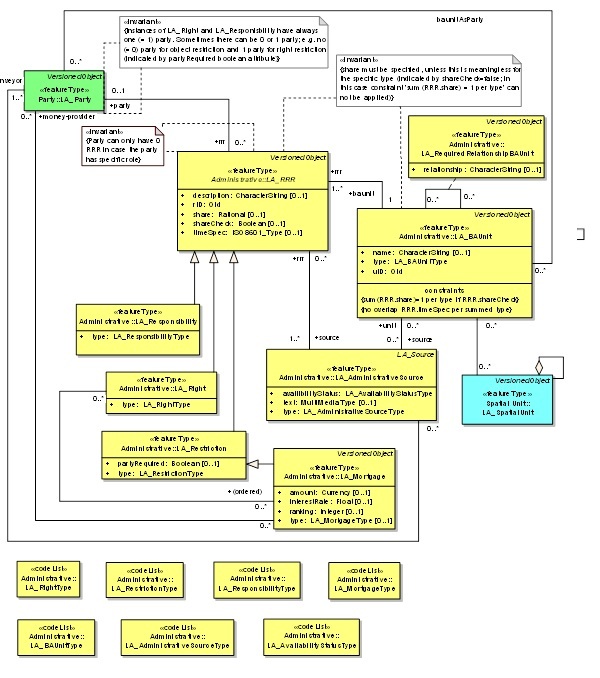 This package concerns the classes LA_SpatialUnit, LA_SpatialUnitGroup, LA_Level, LA_Legal¬Space¬Network, LA_LegalSpaceBuildingUnit, and LA_RequiredRelationshipSpatialUnit (Figure 5). A “spatial unit” is a point (or, multi-point), a line (or, multi-line), representing a single area (or, multiple areas) of land (or water) or, more specifically, a single volume of space (or, multiple volumes of space). Single areas are the general case and multiple areas the exception. 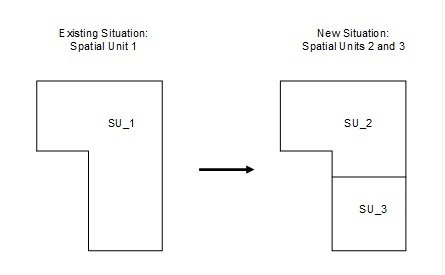 Spatial units are structured in a way to support the creation and management of basic administrative units. 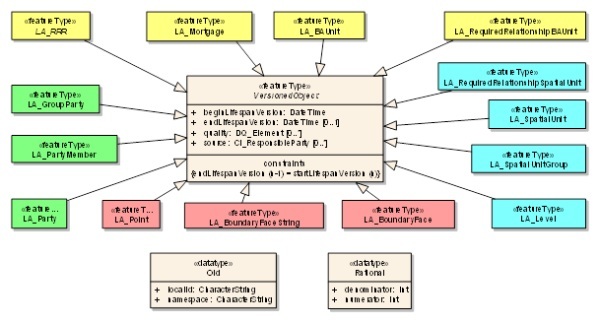 The Spatial Unit Package has one Surveying and Spatial Representation Subpackage (See Figure 6), with classes such as: LA_Point, LA_BoundayFace, LA_BoundaryFaceString and LA_SpatialSource. Class LA_Point includes the attributes pointIdentifier; estimatedAccuracy; interpolationRole (this is the role of point in the structure of a straight line or a curve, e.g. end, isolated, mid, mid_arc, or start); monumentation (this is the type of monumentation in the field, e.g. beacon, cornerstone, marker, not_marked); originalLocation (this is of type GM_Point and concerns the calculated coordinates from original observations in a Coordinate Reference System CRS; explained in more detail in Section 4); pointType (e.g. geodetic control points, or points with or without source documents); productionMethod; transAndResult (transformation and transformed location, the transformed location is a new version of the point). Transformations include for example affine transformations but also mathematical computations such as least square adjustments. Attribute GM_Point (ISO 19107:2003, definition 4.61) in class LA_Point is explained in detail in Section 4 of this paper. Note that there may be 0 or more transAndResult attribute values, implying that there is one (in orginalLocation) or more (in transAndResult) GM_point value for every instance of a LA_Point object class. 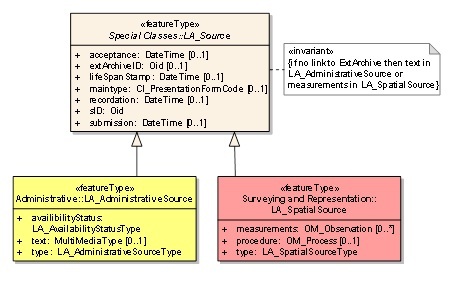 LA_SpatialSource (as a specialization from LA_Source) contains as attributes measurements (see Sections 4 and 5), procedure (see Section 4) and LA_SpatialSourceType. LA_SpatialSource is a document providing facts, for example fieldsketch, GNSS survey, orthophoto, relative measurement, topographic map, or even video (Barry, 2008). See also examples in (Lemmen et al, 2010). The document can be used as authentication for the agreement between neighbors – and also for reconstruction of boundary points in case of disputes. It may be a combination of paper (to be scanned later in the offices) and digital files with observations. LA_BoundaryFaceString – a boundary is a set of points that represents the limit of an entity (ISO 19107:2003, definition 4.4). A boundary face string is a boundary forming part of the outside of a spatial unit. Boundary face strings are used to represent the boundaries of spatial units via line strings in 2D. This 2D representation implies in a 2D Land Administration system a 2D boundary, or in a 3D Land Administration system a series of vertical boundary faces. In that case an unbounded volume is assumed, surrounded by boundary faces, which intersect the earth’s surface (such as traditionally depicted on the cadastral map). Attributes are: boundaryFacestringId; the geometry (on the ground) represented via a GM_MultiCurve (note: topology is optional, but not per se explicitly required, there are alternatives if desired, see Section 3); locationByText (a description of the boundary in words). LA_BoundaryFace – boundary face: a face that is used in the 3-dimensional representation of a boundary of a spatial unit. Boundary faces are used when the implied vertical and unbounded faces of a boundary face string are not sufficient to describe 3D spatial units. Boundary faces close volumes in height (e.g. every apartment floor), or in depth (e.g. an underground parking garage), or in all other directions to form a bounded volume. The volumes represent legal spaces (in contrast with physical spaces). Attributes are boundaryFaceStringId, geometry (represented by GMSurface); locationByText (a description of the face in words). 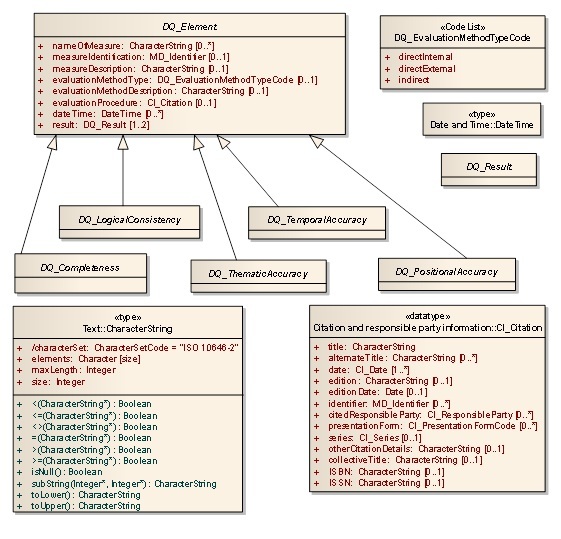 LA_Party attributes (which may an external database) or in LA_Source. descriptive text. This includes the “metes and bounds” descriptions. of the parcels are well defined. In fact, to a human user, the pattern of subdivision is clear. 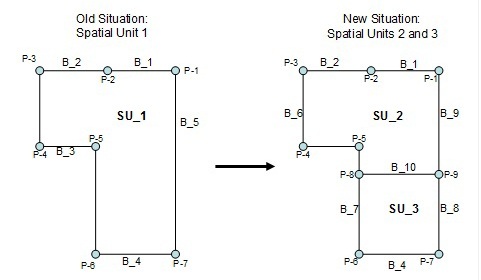 “polygon based” spatial unit (polygon spatial unit) is used when every spatial unit is recorded as a separate entity. There is no topological connection between neighboring spatial units (and no boundaries shared), and so any constraint, enforcing a complete coverage, shall be applied by the originating and receiving software. “topological based” spatial unit (topological spatial unit) is used when spatial units share boundary representations. A topological spatial unit is encoded by reference to its boundaries, with the common boundary between two spatial units being stored once only. Thus there is a topological connection between neighbors. ISO 19152 (Lemmen et al, 2010). In this section, a number of concepts and classed from other ISO TC211 standards (as used in LADM) are investigated in more detail; e.g. GM_Point from ISO 19107, Coordinate Reference Systems from ISO 19111, OM_Observation from ISO 19165 and DQ_Element from ISO 19115. The class GM_Point may look simple at first sight, but is it the start of quite a larger part of the model where relevant cadastral functionality is available; including support of embedded Coordinate Reference System (CRS). The GM_Point itself is a type (class) that inherits from the abstract class GM_Primitive, which in turn inherits from the abstract class GM_Object; see Figure 8. Out of these three classes only the class GM_Point has an attribute of type (class) DirectPostion. All three classes define several (generic) operations. The class DirectPosition has one attribute called coordinate of type Sequence<Number> and one derived attribute called dimension of type Integer. 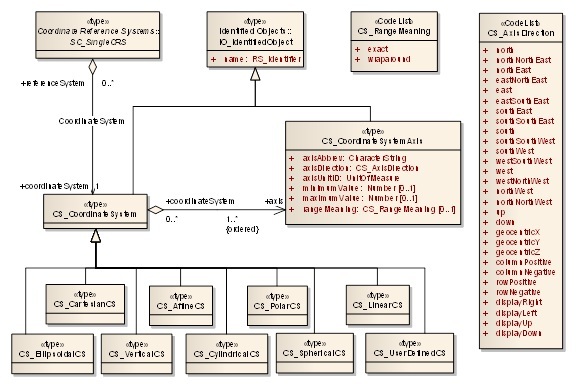 Both GM_Object and DirectPosition have an association to the class SC_CRS (Coordinate Reference System) as defined in ISO 19111 Referencing by Coordinates; Both associations have multiplicity 0..1 at the side of SC_CRS. The abstract class SC_CRS (Coordinate Reference System) has two specializations: the classes SC_SingleCRS (again abstract, with several concrete subclasses; e.g. 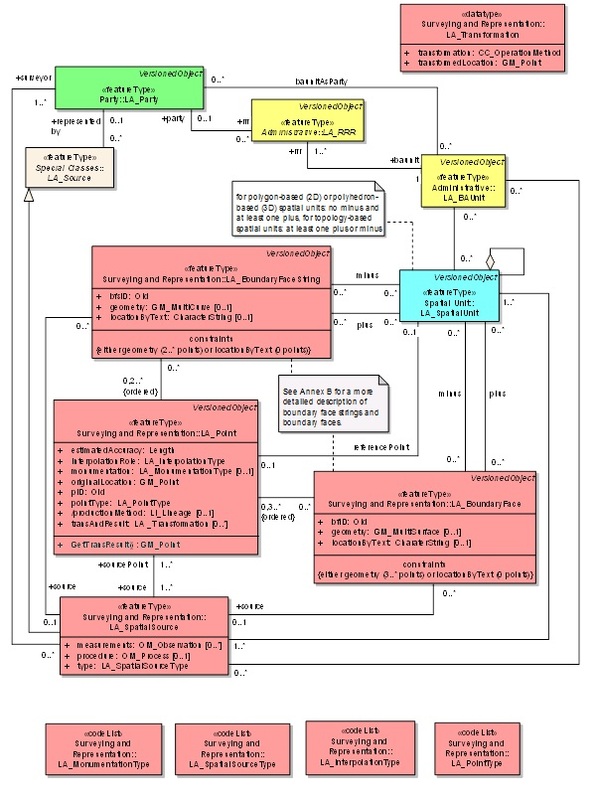 SC_VerticalCRS, SC_GeodeticCRS, SC_ProjectedCRS) and SC_CompoundCRS (abstract, an aggreagtion of SC_SingleCRS); see Figure 9. A SC_SingleCRS is associated with one CS_CoordinateSystem, which has in turn one or more CS_CoordinateSystemAxis; see Figure 10. In summary, GM_Point and SC_CRS are part of a non-trivial model, which should be able to provide all the functionality needed in the context of LADM and the Survey part: supporting various coordinate systems and transformations, see Section 6. Another important ISO/TC211 standard used in LADM is ISO DIS 19156:2010 Observations and Measurements. The survey source data is modeled and stored in LA_SpatialSource. The attribute “measurements” is of type OM_Observation (as defined in ISO 19156) and contains the actual source survey data. 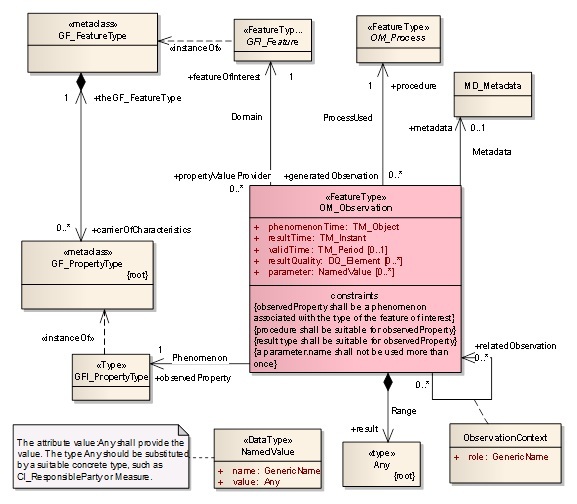 The attribute “procedure” is of type OM_Process and documents the actual survey procedure. The class OM_Observation contains, in addition to the survey data, also attributes for documenting the temporal and quality aspects of the survey; see Figure 11. The class LA_Point inherits of the abstract class VersionedObject. Besides temporal attributes this also provides attributes for quality (of type DQ_Element) and source (CI_ResponsibleParty, this is the responsible organization of a specific instance version in the database). The quality attribute has multiplicity 0..* and so the various quality aspects as modelled via DQ_Element can be represented. 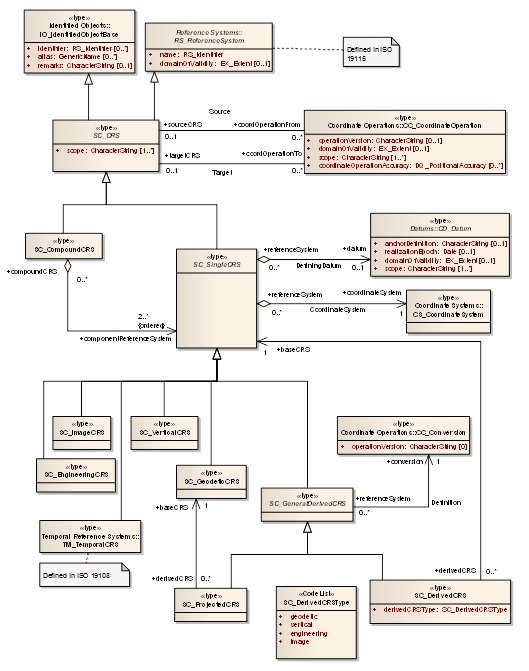 DQ_Element is class from ISO 19115:2003 Metadata. It is an abstract class with the following subclasses: DQ_Completeness, DQ_LogicalConsistency, DQ_ThematicAccuracy, DQ_Temporal¬Accuracy, and DQ_PositionalAccuracy; see Figure 12. The source attribute also has multiplicity 0..* and the class CI_ResponsibleParty is also from ISO 19115:2003 Metadata. Besides a number of names (individual, organization, positional) also the role and contact information of the responsible party is modeled; see Figure 13. Often distinction is made between “general” and “fixed” boundaries, see (Henssen 1995 and also Bogaerts and Zevenbergen, 2001). Henssen relates this to data where can be relied on. He states that the English system mainly relies on physical boundary features, man made or natural. The precise position of the boundary within these physical features depends on the “general” land law of the country concerned. This system is called the “general boundary system”. The LADM also provides, however, for the precise surveyed boundaries to be “fixed” if desired by the owners (or other right holders). Inclusion of the survey data in the Cadastre implies the boundary to be “legally fixed”. In some land administration systems the location of the boundaries is guaranteed. The choice between “fixed” and “general” boundaries depends according to Henssen on the pace of creating or updating the system, the existence of physical feature, disputes to be expected, the amount of necessary security and costs. Important observation in the field may be to identify to whom the physical boundary belongs. Fixed boundaries are based on surveys in the field. 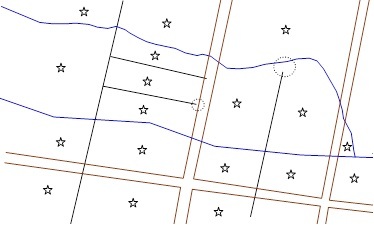 Cadastral boundary measurements are input for a cadastral mapping process resulting in coordinates, often published in combination with point identifiers, bearings (directions or azimuths) and distances between the points; see Figure 15. A cadastral map can be seen as a social map as explained above. 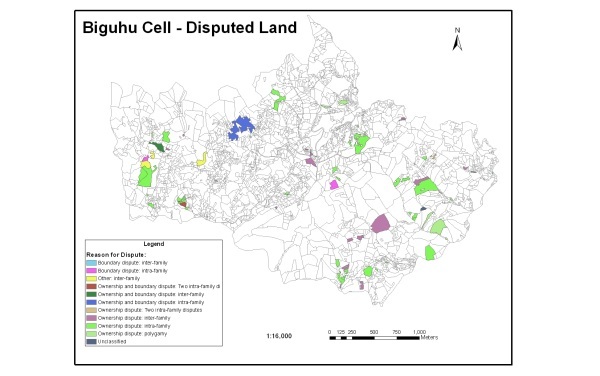 This means that land disputes can be visualized in relation to boundaries; see the example in Figure 16 (courtesy: National Land Centre, Rwanda). An example map with disputed lands cannot be produced without boundary observations. A boundary between two spatial units (can be parcels) is (in principle) to be identified in the field. This is often called “collecting evidence from the field”. Identification may be very well possible in a very accurate way in some cases (e.g. with a 10 cm accuracy). But in many cases this level of accuracy is not possible in boundary identification. This implies that the precision of identification of boundary vertexes can be “less accurate” then the precision of surveys. For this reason (and for reconstruction purposes) monuments can be placed (beacons, markers, other). Here it should be noted that monuments can be moved to another place…..
Apart from surveying (total station, GNSS based surveys etc) it should be observed that such boundaries may be identified in the field using areal photo’s, satellite images (Lemmen et al, 2009) or existing topographic maps. In such cases boundary are drawn using pens or digital pens. A digital pen “knows” its location on the printed aerial photo or satellite image because a pattern is printed on the photo which can be read by the pen. The pen is a device which can be connected to a computer where super imposition of the drawn boundaries with the image can be done. Of course it also possible to vectorise directly on top of the image if both neighbors are represented. Rugema (2011) identified the advantages of using digital pens for boundary drawing in the field on top of high resolution ortho photo’s (used as normal for drawing boundaries in Rwanda): easy for local people in Participatory-Mapping; boundaries direct georeferenced on site; digital pen predictable for climate conditions; rechargeable after long time used and no loss of data when battery is discharged. Examples of other data acquisition tools are mobile mapping tools, see for example Lemmens (2010). Most relevant for LADM is not the different approaches in data acquisition but the options to include the results of data acquisitions (and processing of those data). The results of cadastral survey projects are measurements with a certain accuracy (precision) that can be used to describe the geometry and quality of objects that can be stored in the geo database. The association between measurements and spatial units is part of the LADM. In many cases the measurements and observations and their accuracy (precision) are not stored in the geo database. The quality that can be derived from the precision of measurements is usually only stored in the geo database as meta-data about the whole dataset and not per point, although this information is available from the survey projects results (Worboys, 1995). Data collected from surveys and derived coordinates can be managed by the LADM by using the Surveying and Representation Subpackage. All documentation related to cadastral boundary surveys can be included in LADM. Boundary Points or vertexes can be collected in the field by means of conventional surveys or (hand held) GNSS based systems, etc. Points can be collected in an office environment (digitizing), or can be compiled from various sources, for example using forms, field sketches or orthophotos. Points can be used to compose boundaries (boundaryFaceStrings). These GM_Points in LA_Point are defined in a CRS as explained above in Section 4. A SpatialUnit can be 1D, 2D, 3D. Very common is a 2D cadastre, 3D Cadastres are not common yet but in the focus of interest in many countries. The dimension of a GM_Point can also be 3D. In this section the use of LADM in relation to a classical sub division of an existing spatial unit is discussed. Before the process starts this concerns an “existing situation” and a “requested situation”, when the process is finalized there is an “old” and “new” situation; where the “new” situation is the up to date “existing” situation again. 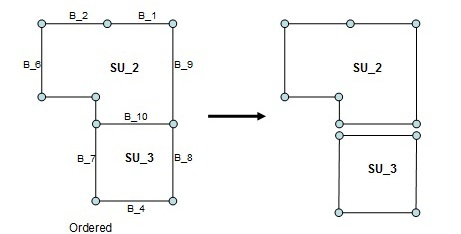 See the example case below in Figure 17. Observations from surveys can be represented in LA_SpatialSource using the OM_Observations attribute, see Figures 6 and 11. This concerns the original observations; e.g. GNSS coordinates or, in case of using a total station: directions, distances, observed control points, etc. Other observations can be digitized points (e.g. photogrammetric) with point series, arc series. It should be noted that parallel to, perpendicular to, collinear to, unit identifiers, object identifiers, are also observations; even agreement between neighbors on the location of the boundary belongs to this category. The documents can be represented in LA_Source using CI_PresentationFormCode attribute. See Figure 2 for the LA_Source classes. See for an example Figure 18 with surveyed points and other observations. MP is Measured Point. In this sample the total station is set up at an arbitrary location but of course also a set up at a control point or a total station with integrated GNSS receiver is supported where data storage in LADM is concerned. The raw data should be stored together with its quality information (typically a set of standard deviations). A set of measurements and observations (geometrical relations and conditions) and control points will form a network. The network consists of the field data, the control points and general parameters like dimension of the network, used CRS. Now the calculation of the coordinates from the observations can be performed. This implies transformations and/or geodetic adjustments. Adjustments are needed in case of redundant observations, e.g. observations related to points observed with a GNSS device which are also measured using tape. Or points which are observed with total stations from different setups. In the example above GNSS measurements are not included. Least squares adjustments or any other adjustment approach may be used to compute an optimal solution. This means all observations get corrections in such a way that the adjusted observations will fit into the mathematical model. E.g. : in 2D plane geometry the sum of the angles in a triangle will be equal to 180 deg. This mathematical condition is generally not valid for the original observations due to (small) observation errors. The magnitude of the corrections to be applied to the observations can be used for testing to identify outliers. The least squares adjustment methodology is a good tool to get an optimal solution in networks where redundancy exists. The results of the adjustment process are calculated coordinates which can be represented in LA_Point under the attribute originalLocation. The transformation parameters can be represented under transAndResult, see LA_Point in Figure 6. Having this information available in the geo database a least squares adjustment engine can at any time be used to re-adjust the network of observations. It is recommended that the applied least squares engine uses a sophisticated mathematical model in which (almost) raw observations can be entered, thus avoiding all kinds of reductions/ corrections which should otherwise be applied in a preprocessing step. Besides computing final adjusted coordinates it is also important to check the validity of the available observations via a proven testing procedure. Most least squares adjustment engines provide a robust data snooping method which is very useful to identify outliers. When managing (manipulating, retrieving, analyzing and presenting) the geographically referenced data in the LADM database, quality information can be used to interpret the results of the operation. For example, if one combines two parts of different datasets each containing the same parcel, but represented by different shapes, quality information may help to decide which representation is best. It should be noted that the mathematical method being used for coordinate determination is independent from LADM, but observations and the calculated coordinates can be integrated in the LADM. Adjustments can be reiterated zero or more times (and recorded in the LA_Point attribute transAndResult of type LA_Transformation, which stores both the transformation method details and the resulting GM_Point), e.g. when additional observations become available and/or when additional LADM control points are included (their coordinates being represented under LA_BoundaryFaceString). The results of the re-adjustment can be included in the geometry attribute of LA_BoundaryFaceString. Now the original observations are stored in LA_SpatialSource, the originalLocation with calculated coordinates are stored in LA_Point (see Figure 6) and the adjusted points in boundaries are stored LA_BoundaryFaceString. The transformation parameters can be kept, as well as the survey procedure, the estimated accuracy, type of monumentation in the field, etc. The estimated accuracy of a point can be derived from the coordinate calculations and from the corrections to observations in the adjustment calculations. This is a basis for knowledge about the accuracy of “the map”. Similar approaches can be used in digitizing existing maps: the original observations can be stored, the scanned map can be stored, extra measurements can be included (e.g. related to “roof and ground situation” in case of photogrammetry) and transformations can be performed. The subdivision case means the following (in case of a topological based storage of data); see Figure 19 and 20. Polygons may be calculated now after subdivision; again this process is not relevant for LADM, it is important to recognize that the results can be stored. Calculated area’s can be included into the model now. Again: for the implementation of LADM it is not important how the management of area sizes is organized. It is possible to work only with calculated area’s or with registered and calculated area’s. This means it is useful to keep the transformation parameters, same for the calculations of coordinates and the adjustments to the original observations. 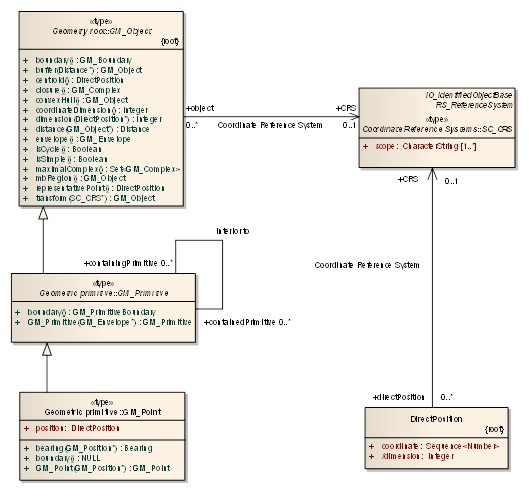 References to workflows can be made using attributes as “submission”, “acceptance” and “recordation” in the LA_Source class. 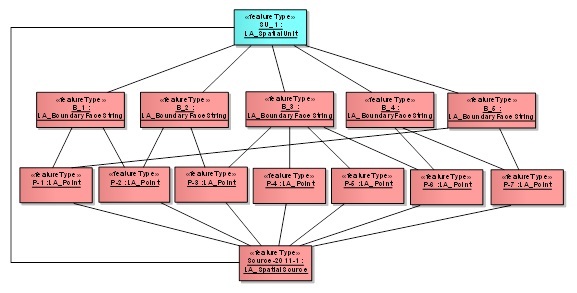 Figures 21 and 22 show the instance level diagrams with instances of LA_Spatial, LA_BoundaryFaceString, LA_Point, and LA_SpatialSource related to the sub division and history management: before and after the split of SU_1 into SU_2 and SU_3. In LADM timestamps are linked to all contents via LA_VersionedObject; except to LA_Souce, this means that all data are kept, also after deletion and eventual introduction of new versions of the data. In other words: history management is supported. LA_Source are by definition authentic and can not be changed. Sources from external archives may be used; e.g. from private surveyor. In the example above the calculated points P1, P7, P8 and P9 are associated to 2 spatial source documents: 2011-1 and 2011-2. Under 2011-1 there may be 2 versions of points P1 till P9 (first in a local CRS, then in a general CRS). Under 2011-2 P1 and P7 are used for connection of the field observations and those points do not get a new originalLocation; only a new version because of the new association with 2011 Source document. It can be observed in many local cadastral applications in developing countries that the issue of adjustment of surveys has no or insufficient attention. Often trials are made to make new observations fitting to the map by cutting lines or extending lines based on estimations and use of CAD functions. This is not the most accurate method and this may have implications on the accuracy of calculated area’s. On the other side we can see that providers of survey devices include functionalities for on site adjustments – this may be linked to LADM. The approach as presented in this chapter may look as a sophisticated approach – but it is normal surveying. One more observation is that there will be more and more options for people in the future to determine boundaries themselves – e.g. using high resolution images. In some cases extra observations may be needed. In this paper the surveying and spatial representation subpackage of the LADM was analyzed in more detail. As this relies on a number if other ISO TC211 standard, their relevant parts were also analyzed in order to fully understand the modeling of surveying (and the association to the spatial units). A typical 2D terrestrial survey was used to illustrate the capabilities of the LADM in this respect. It is concluded that the existing LADM was indeed sufficient (both as basic structure, but also with respect to presented classes and attributes). No (important) elements had to be added to the model (and are these to be expected similar in other cases). In the future additional example cases for alternative spatial data sources should also be investigated: 3D surveying, ortho photo, and GPS based measurements. If all fitting within LADM this will show how generic LADM is. In further investigation we will analyze the use of exiting types of survey (hardware/software) solutions; e.g. MOVE3, ESRI‘s Survey Analyst, Trimble, Leica, etc, etc within the context of the LADM. The authors of this paper would like to express their gratitude to the ISO 19152 project team members for their contribution to the LADM standard (in a true team spirit). Special thanks to team member Rod Thompson for his important contribution w.r.t. the 2D and 3D (integrated) modelling of LA_SpatialUnits. Also outside the scope of the project team several persons did have important contributions to the development of LADM: João P. Hespanha, Jan van Bennekom-Minnema, and Halil Ibrahim Inan. Barry (2008), Talking Titler Object Manager Manual, Geomatics Engineering University of Calgary. Bogaerts, T. and Zevenbergen, J.A. (2001), Cadastral systems: alternatives. Computers, Environment and Urban Systems, 25 (4-5), pp. 325-337. Fourie, C. and H. van Gysen (1995). "South Africa just before and just after the elections:land policies and the cadastre." Geomatica 49(3): 315-328. Henssen, J.L.G. (1995). “Basic principles of the main cadastral systems in the world”. In Proceedings of the One Day Seminar of the FIG Working Group Cadastre 2014, held during the Annual Meeting of Commission 7, Cadastre and Rural Land Management, of the International Federation of Surveyors (FIG), May 16, Delft, The Netherlands. ISO, CEN TC287 /WG 3, 2009. 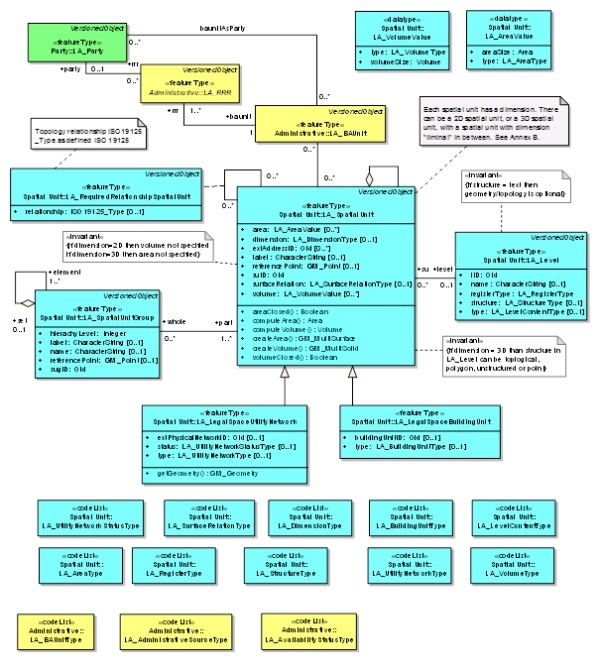 Geographic information – Land Administration Domain Model. Technical Report draft of ISO 19152 (N1360), International Organization for Standardization, 2009. ISO (2011). ISO/DIS 19152. Draft International Standard (DIS). Geographic information - Land administration domain model (LADM). Geneva, Switzerland, ISO: 110p. Jackson, J. (1996). "Extending the South African cadastral system using a mid-point method." South African Journal of Surveying and Mapping 23(5): 277-284. Kaufmann, J., Steudler D., 1998. 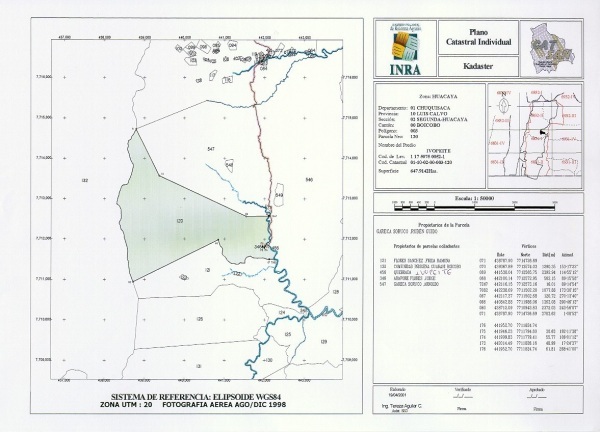 Cadastre 2014. A vision for a future cadastral system. FIG-Commission 7, Brighton, U.K.
Lemmen, C. H. J., J. A. Zevenbergen, M. Lengoiboni, K. Deininger and T. Burns (2009). First experiences with high resolution imagery based adjudication approach in Ethiopia. The World Bank Annual Bank Conference on Land Policy and Administration. Washington, D.C.
Lemmen, Ch., Van Oosterom, P., Thompson, R., Hespanha, J., Uitermark, H. (2010). The modelling of spatial units (parcels) in the Land Administration Domain Model (LADM). FIG Conference 2010. Sydney, Australia, FIG. Lemmen, Christiaan, The Social Tenure Domain Model, FIG, 2010. Lemmens, Mattias, (2010), Mobile GIS Systems, GIM International, December 2010, Volume 24, Number 12. Lester, K. J. and J. Teversham (1995). 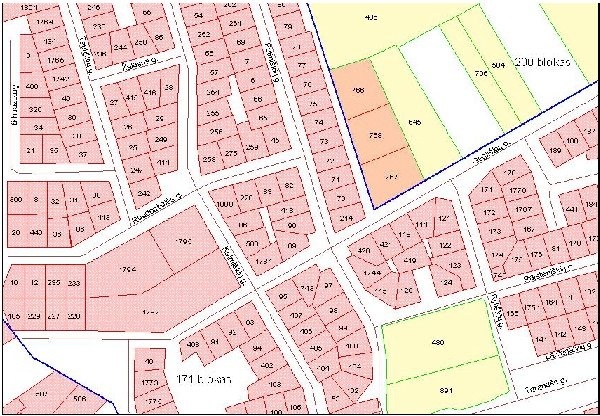 "An overview of the cadastral system in South Africa." South African Journal of Surveying and Mapping 23(2): 103-114. Milindi Rugema, D. (2011) Evaluation of digital pen in data capturing for land administration purposes in Rwanda. Enschede, University of Twente Faculty of Geo-Information and Earth Observation ITC, 2011. Törhönen, M.-P. and D. P. Goodwin (1998). "Would a registry map hang comfortably in a round mud hut? A register of title for Zimbabwe’s communal areas: philosophical and technical considerations." Australian Surveyor 43(2). Worboys, M.F., GIS: A Computing Perspective, Taylor&Francis, 1995. Peter van Oosterom obtained an MSc in Technical Computer Science in 1985 from Delft University of Technology, The Netherlands. In 1990 he received a PhD from Leiden University for this thesis ‘Reactive Data Structures for GIS’. From 1985 until 1995 he worked at the TNO-FEL laboratory in The Hague, The Netherlands as a computer scientist. From 1995 until 2000 he was senior information manager at the Dutch Cadastre. Since 2000, he is professor at the Delft University of Technology (OTB institute) and head of the section ‘GIS Technology’. He is the current chair of the FIG joint commission 3 and 7 working group on ‘3D-Cadastres’ (2010-2014). Christiaan Lemmen holds a degree in geodesy from Delft University of Technology, The Netherlands. He is an assistant professor at the Faculty of Geo-Information Science and Earth Observation (ITC), University of Twente, and an international consultant at Kadaster International. He is chair of the Working Group 7.1 ‘Pro Poor Land Management’ of FIG Commission 7, ‘Cadastre and Land Management’, and contributing editor of GIM International. He is director of the FIG International Bureau of Land Records and Cadastre OICRF. Harry Uitermark holds a degree in geodesy from Delft University of Technology, The Netherlands, and received a PhD for his research on ‘Ontology-based geographic data set integration’ in 2001 from the University of Twente, The Netherlands. He worked many years with the Dutch Cadastre, and has been a visiting scientist at the Faculty of Geo-Information Science and Earth Observation (ITC), University of Twente.